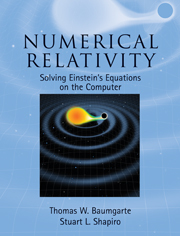 Aimed at students and researchers entering the field, this pedagogical introduction to numerical relativity will also interest scientists seeking a broad survey of its challenges and achievements. Assuming only a basic knowledge of classical general relativity, the book develops the mathematical formalism from first principles, and then highlights some of the pioneering simulations involving black holes and neutron stars, gravitational collapse and gravitational waves. The book contains 300 exercises to help readers master new material as it is presented. Numerous illustrations, many in color, assist in visualizing new geometric concepts and highlighting the results of computer simulations. Summary boxes encapsulate some of the most important results for quick reference. Applications covered include calculations of coalescing binary black holes and binary neutron stars, rotating stars, colliding star clusters, gravitational and magnetorotational collapse, critical phenomena, the generation of gravitational waves, and other topics of current physical and astrophysical significance. Preface; Suggestions for using this book; 1. General relativity preliminaries; 2. The 3+1 decomposition of Einstein's equations; 3. Constructing initial data; 4. Choosing coordinates: the lapse and shift; 5. Matter sources; 6. Numerical methods; 7. Locating black hole horizons; 8. Spherically symmetric spacetimes; 9. Gravitational waves; 10. Collapse of collisionless clusters in axisymmetry; 11. Recasting the evolution equations; 12. Binary black hole initial data; 13. Binary black hole evolution; 14. Rotating stars; 15. Binary neutron star initial data; 16. Binary neutron star evolution; 17. Binary black hole-neutron stars: initial data and evolution; 18. Epilogue; Appendixes; References; Index.